so the flywheel motion is quiet, smooth, long-lasting, and maintenance-free. Provides a superb aerobic work-out. Exercises every major muscle group in the body. Gives the heart and lungs superb cardiovascular conditioning. Is a time-efficient form of exercise. Is an excellent stress relieving option. Is great for rehabilitation due to being weight-supporting and non-jarring. Is an extremely effective fat burning and weight loss exercise. Can be a lifelong exercise, suitable for people of all ages. Provides a smooth, rhythmic movement which is safe and enjoyable. Adjustable monitor arm allows for more compact and convenient storage. full leg engagement in the rowing stroke which facilitates a true, full-body workout. Ergonomic handle allows for a more natural arm and hand position whilst rowing. Fan designed to minimize noise while providing the smooth feel of rowing on the water. Choice of a sleek, fast boat feel, or a slow, heavy boat feel. Caster wheels for mobility – easy for one person to move. Bold colour scheme and graphics. Easy to store away – Can be stored standing in a closet or corner. Easily separates into two convenient pieces. 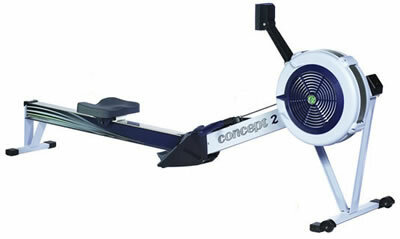 Buy Concept2 Model D Rower (PM4 Console) online. If you are interested in the Concept2 Model D Rower (PM4 Console) for sale, feel free to enquire above.